From a moral & ethical perspective, there were many places I didn’t align with Robert Kiyosaki. At first the book was a bit tough for me to get through for that reason. After chatting with a few folks who were reading along, I noticed many of us were feeling this and it helped me meet the book with my critical mind. Once I shifted into critical thinking mode while reading, taking moments of pause to disagree and internally clarify how I felt about a particular point, I quite enjoyed the book. I’m taking away a lot from this book, but the main this is the realization that if I want to expand & develop my financial intelligence, I’m going to have to start reading more books by people who I will likely not align with ethically or morally. That realization feels like it’s opening me up to a lot of new books I wouldn’t have otherwise picked up. All in all, I’d recommend this book with the note of encouraging readers to meet the pages with their ethics at the forefront of their mind. Also, there is some extremely problematic language towards the end of the book that is disrespectful towards the Indigenous tribes of America and that erases the reality of colonization. I’d also add a trigger warning for Indigenous people. Alright, take a deep breath! In March, we’re diving into finances. If you’re feeling overwhelmed, it’s okay! This is a big subject and for those of us who didn’t have access to information about wealth management growing up, it’s often a very emotional topic. Focus on this if you’re overwhelmed: education is always an asset. You can move as slowly as you need to with this topic. I just want to encourage you to show up each day for even just 10 minutes and do you best. Don’t let your goal slow your progress. Sometimes having a specific goal can work against you. If your goal is to read 8 pages a day but you feel exhausted and you don’t even read one, don’t let that keep you from ever picking the book up again. Just reassess & restructure your goal to meet your needs. Maybe you add 1 extra page for the following week, maybe you give yourself an additional day at the end of the month, or maybe you add a month to your overall goal. Whatever pace you go at, just keep picking up your book. This book has been on my list for awhile. I grew up with a single mother and didn’t learn anything about managing my finances or creating healthy money habits as a kid. As an adult, I’ve worked really hard to peel back the many layers of shame surrounding money to change my relationship with my finances. I first started working on my financial health about 6 years ago, but things really changed last year after reading Worth It by Amanda Steinberg. That book inspired me to develop a daily system for organizing our family finances and a plan to guide our spending decisions. This system has helped us save more than ever before and has even given us the opportunity to take a month long trip to Denmark this July! I’m inspired to dig deeper into the information I didn’t have access to as a child/young adult, and this book is one that comes highly recommended for that exact purpose. 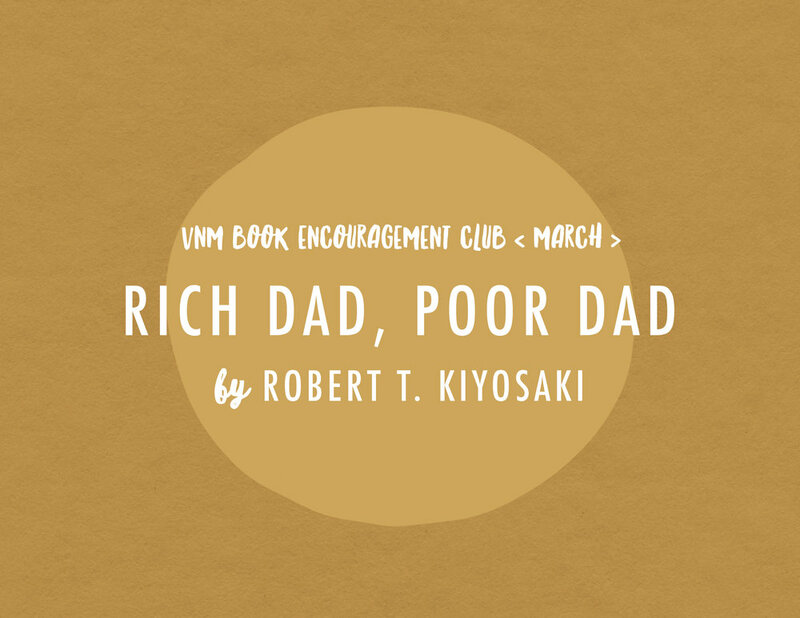 “In Rich Dad Poor Dad, the #1 Personal Finance book of all time, Robert Kiyosaki shares the story of his two dad: his real father, whom he calls his ‘poor dad,’ and the father of his best friend, the man who became his mentor and his ‘rich dad.’ One man was well educated and an employee all his life, the other’s education was “street smarts” over traditional classroom education and he took the path of entrepreneurship…a road that led him to become one of the wealthiest men in Hawaii. Robert’s poor dad struggled financially all his life, and these two dads—these very different points of view of money, investing, and employment—shaped Robert’s thinking about money. 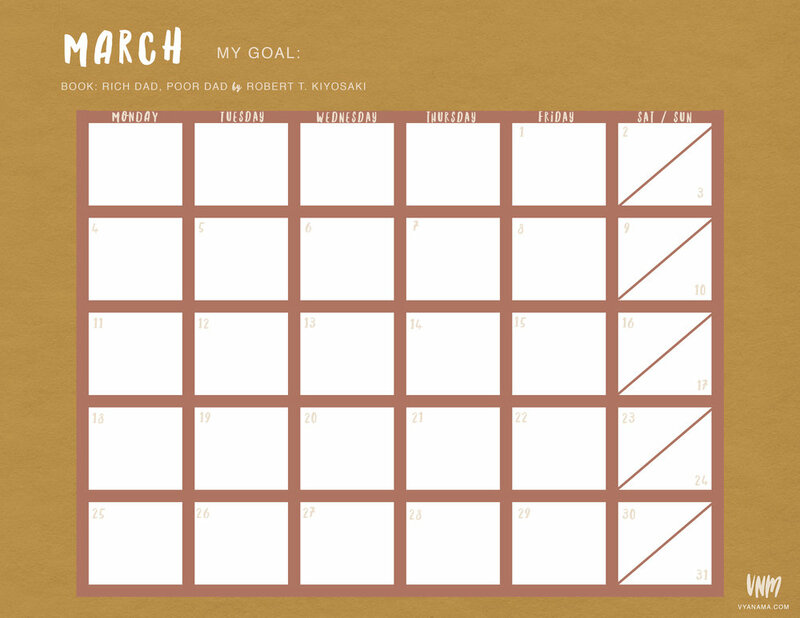 To track your goal, print out the calendar sheet below (click to download). Once printed, fill in your daily page goal in pencil (so you can adjust if need be) and hang it somewhere you’ll regularly see it. I like to use the inside of kitchen cabinets, the refrigerator, or a next to the bathroom sink.